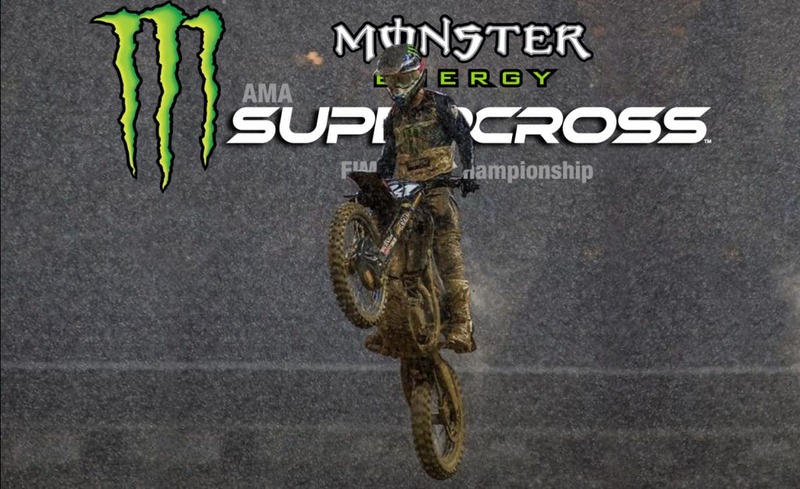 A day of relentless rain turned Petco Stadium in San Diego, California into a muddy nightmare for the fifth round of the Monster Energy Supercross Season. The conditions reduced the racing into a survival run and mixed up the points in both classes. Even though the night’s racing was filled with unpredictable changes in fortune, it was the old guard of Supercross who prevailed, with the preseason favorites back in front. Kawasaki’s Eli Tomac was unquestionably the fastest rider on the track. He won his heat and utterly dominated the main. Kenny Roczen actually had the holeshot, but fell almost immediately. By the final lap, he had put his Honda all the way up into second, only to get passed by Red Bull KTM’s Marvin Musquin within sight of the finish. The one rider who almost upset the podium status quo was Justin Bogle, who held second and matched Tomac’s speed for most of the race. In the last few laps, he fell back to fourth, but it was clearly a confidence booster for him. The points now show Tomac on top, with last week’s winner Cooper Webb falling back to fourth. In the 250 class, it was an excellent night for Adam Cianciarulo, giving Kawasaki a two-class sweep. He had to settle for second in his heat behind Dylan Ferrandis, but his main event was absolutely flawless. Ferrandis, on the other hand, suffered several crashes in the mud and could only salvage a seventh place. It was an even worse night for his Monster Energy Yamaha teammate Colt Nichols, who came into the night with a small points lead and left in third place. Nichols started the evening well with a second place in his heat, but had a number of mishaps that put him all the way back in 10th. The red plate will now be on Cianciarulo’s Pro Circuit Kawasaki, but we won’t see it for a couple of weeks, and the Monster Energy Supercross season will head east and give the Eastern Regional 250 class a shot at racing.